With a presence on the Internet since 1997, we have a very rich collection of testimonials, reviews and “thank you” notes from guests who have entrusted Dolphin Hellas with their holidays throughout these years. Thank you for your wonderful card. We are still talking among friends, how Esther and you saved our vacation. Your ears must be ringing. We wish both of you and your families a happy holiday season and a prosperous year 2001. Our invitation to visit us in Arizona, of course, stands unchanged. Thank you Aliki, we enjoyed our visit to your beautiful city and country so much, we still talk about it and now fix Greek salads and tomato and cucumber salads a lot. PS We are near Atlanta, GA and having our first White Christmas (snow on the ground) in 104 years! I hope it is warmer in Athens! Thank you for responding so quickly, I appreciate it and we hope to visit Greece again in the near future. We will definitely use your agency again when the time comes. Thank you for all your help and have a Merry Christmas and Happy New Year. Dear Uli------I would like to thank you for the wonderful job you did in taking care of the Palmers, Barb Eder and me, Nancy Diehl on our very memorable trip to your beautiful, friendly country. Our Classical tour with Ireni and Christos was so informative it will take a while to sort it all out. The Acropolis View would not be recommended--several things were not addressed that needed to be--the toilet leaked and we had to turn off the water after the tank filled & a problem with electricity---Just thought you should know. We hope to return soon and you will be our choice. Brenda and I want to thank you for the terrific arrangements and suggestions you made for us. Everything, and I mean everything, worked out perfectly, including the weather. We had an absolutely wonderful time every day and night and even traffic in Athens was no problem (since we weren't driving). Food was excellent everywhere and the hospitality just a delight. We will gladly recommend your friendly and knowledgable services to anyone considering a Greece vacation. I want to thank you for processing the refund for the ferry tickets. Our visit to Greece was wonderful, despite the unplanned changes to our plans. The Greek people who helped us adjust to the canceled ferries went out of their way to help us find lodging in Athens at a time that hotel rooms were hard to find. Instead of visiting Naxos we rented a car and drove to Finikunda and stayed at the Finissia Hotel. After an intensive week of touring historical sites, it was a delightful change of pace. Most of all, we were humbled by the ancient Greeks' contributions to the development of Western civilization which came alive through our visits to ruins in Athens and on the Peloponnese peninsula. My wife, Lynn, is a 6th grade world history teacher and has brought this experience into her classroom and her school with enormous success. We are already planning our next trip which will start in Greece and include visits to the Greek islands and Turkey. We are looking forward to revisiting Athens and continuing our travels east. i'd like to txs for yr vry vry vry kind coop/help(htl reservation, taxi etc..) l! yr city was fantastic ! we were first time in greece ! greek peaple are vry friendly, nice girls etc..
i took some videos as well. after watching this film, i wish to visit yr country/city with my wife as well in oct 2001 (ath, plus one/two islands) ! We cannot thank you enough for all you have done for us. You are an amazing person, incredibly skilled at what you do. THANK YOU!!!! My purpose of this email is to let you know how wonderful and helpful your sight was and to tell you how wonderful Uli from Dolphin Hellas was! Devon and I were married on Oct. 7th, 2000 and spent our honeymoon in Athens, Samos and Santorini (suggestions from Matt). I must admit I was a little nervous at first booking this trip via internet and email access only, but Uli was absolutely wonderful and very responsive which helped put our minds at ease over the last months of planning. Neither Devon nor I had been to Greece and we were going into this blindly as a suggestion from our Norwegian friend. As I researched all possible web sites I ran across yours...I found it to be the best sight out there! Your sight was extremely helpful with a touch of "down to earth", not one of those overly commercial sights were you're not quite sure if they are trying to sell you the shirt off your back! As Devon and I became serious about honeymooning in Greece it came time to decide what to do as far as a travel agent. This is where your handy dandy link to Dolphin Hellas came in perfectly. I emailed Dolphin Hellas and was blessed with the response of Uli! She took very good care of us! She was quick, very responsive and helpful with all of the questions we had. She even called us the night before we were to leave the States regarding an Olympic Airlines strike that put a little kink in our plans. We gave her our thoughts on what we were looking for and what she booked for us neither Devon nor I would have ever expected! She put us in some beautiful places that will remain with us for a lifetime! I wanted to thank you both for your help. Matt, if it wasn't for your site I don't know if we would have gotten enough inside information that would have interested us in Greece. Uli, you did an incredible job on booking our honeymoon we can't thank you enough. It was a pleasure meeting you when we were in Athens! It's the combination of the two that made this a special trip for us that I know we will never forget. Thanks very much for the great hotel choices. They worked out perfectly for us. Our room in Santorini was extra special because of the wonderful view. The Acropolis View and Hotel Elena were excellent too. The Sea View was average, but it was close to the airport like we asked. When we return to Greece, we will contact you again. We will definitely recommend your agency to any friends that travel to Greece. We had a wonderful time traveling in your country. it took me about week to settle down here in Finland: big piles of post and requests to call were waiting on my desk. Feeling was like bucket of ice cold water pourn to neck after such a lovely holiday! We did go to see Olympiakos -game (You are right: that goal was embarrasing!) and we tried to get tickets to Shirley Basset's concert with no luck. As for the hotels they were great: in Hera we missed balcony until we discovered the roof garden. The view to Acropolis is amasing! We spent one night just sitting there, sipping wine and looking at Acropolis. At Poros we spent time jogging, swimming and suprise, suprise watching football! I don't remember name of the bar, but people there were very helpful finding out results and timetables of the classification games and they also offered us chance to watch Greece - Finland -match (no more about that game!). We found many good (and relatively cheap) restaurants at Poros. Especially souvlakis and stifado were great. Actually I gained 4 kilos - dispite of all exercise we had. Well, maybe beer, icecream and cakes had something to do with that too... Speaking about food: that meat in your "lunchbox" was reindeer (amusingly it is PORO in finnish language). Reindeer lives wild in northern parts of scandinavia, that is north from polar circle. In addition to its meat people use its fur in clothing and its powdered horns as natures viagra... That last one is kind of joke here, but japanese tourists really believe it: maybe they have empirical proof? Just a fast note to say thank you for the wonderful trip!!! All of our reservations and accommodations were great. Chania and Crete were our very favorite. We definitely will want to go back there and spend alot more time. When we are ready we will contact you again for arrangements. Again thank you for your assistance and recommendations. They helped to make our holidays fantastic. Deborah DeM. and Kathryn J.
Dear Uli. Our trip to Greece was more wonderful than we could have hoped for. Your help was First Class, everywhere we went we experienced nice people, professional attitudes and great accomodations. We deeply appreciate the care that you took on our behalf, and the fuss that was made over us at each destination because you told them we were honeymooners. Your talents are very respected, and we will both contact you in the future for all of our Greece Travel needs, and will recommend you to everyone we know. Faithfully Yours, Bill and Derys J.
Hello, we hope you remember us! You put together a wonderful Greece honeymoon for us that we took in May. We stopped by your office to say hi and took a picture with you, which I have attached. I just wanted you to know that we had an absolutely wonderful time, and that everything was incredible! We couldn't have enjoyed ourselves more. We want to thank you for your help, without you, I don't know how we would have gotten it all together! Again, thank you. We will remember this trip for the rest of our lives. You helped to make it very special for both of us. First, let us express our sorrow to you concerning the loss suffered in your country due to the sinking of the Ferry last week. We sincerely hope you had no relatives or friends on the boat. We took the ferry from Paros to Athens on Sunday the 24th so we were really shaken up to hear the news. Now, about our trip. We loved your country and had a really wonderful time. You picked very good places for us, considering you didn't even know us. First- S. Nicolas in Rhodes. He is really strange but luckily, other than when we checked in, we didn't have to deal with him much. His wife handled most things. Tell your clients that l) taxis can take them to the hotel from the airport. They are reluctant to do so because of the pedestrian traffic in the old city, but I knew it was legal if you had luggage so I just kept at it until I found one that would take us. If you don't go into the old city by taxi and they drop you at one of the eleven or so gates and if its the wrong one, it would be a very a very difficult trip with luggage. The hotel tells their guests to go directly which gate, but arrangements made through a travel agent don't so there were a lot of angry guests there! If you can get the wife to like you which we apparently managed to do, and show an interest in the archeological history of the site of the hotel, she is more than willing to help you out and she was very pleasant to us. In his defense, he is very active at preserving Old Rhodes and fights a lot of battles to do so. Also the word "suite" as it applies to our room is very misleading, which they know. It was a great room, but only one big room. But the other rooms are so small (those not referred to as suites) that I wouldn't have wanted one anyway. We loved Rodos and Lindos was great too. Also rented a car and drove around. Onto Mykonos. Hotel was very well situated. Quiet, a great view, a 5 minute walk to bus to beach and a 5 minute walk to town. People at desk were great. Delos was terrific too. Enjoyed the beach at Platys Gialos. Then to Santorini which was our favorite place. Butterfly villas is not air conditioned. Every other place was and it tended to be a little hot at night but not uncomfortably so. The woman who owns the place is from the Ukraine and has limited English at best. The other 3 owners also do not speak english well. We went next door to the Volcano View villas for car rentals, questions, etc and they were most helpful. But our pool, veranda, view etc were just sensational and we loved the whole island-Oia, the road and view up to it, Pyrgos, and we rented a car so we really saw a lot. Then onto Paros. You were right, we much preferred Noussa to Paroikia and the hotel was great. They are expanding. The manager, a woman named Georgia, was particularly helpful to us. Lefkes was a beautiful village which we enjoyed visiting and we rented a car and drove around and to the beach as well. It was amazing to be in a country that had so many strikes going at one time- the post office closed in Mykonos for three days. When we went to catch the plane to Athens and then to Mykonos, Olympia airlines was on strike or slow down. Then the Minoan boat strike which meant some more waiting for the right boat. I think you have a hard country to live in, in in terms of getting anything done. We met a lot of great people from all nations and learned a great deal about Greece from the newspapers, Greeks, etc. We will definitely plan another trip to Greece. It was beautiful and relaxing too, with enough time between sightseeing to go to beach and pool. Thanks for all your help with this. Promise to give you more notice next trip! I just wanted to let you know what a wonderful time we had in Greece! Your arrangements worked out perfectly with only one exception that didn't occur to me. Dave missed his connecting flight to Athens and had no way to let Art know that they wouldn't be able to meet as arranged. They had arranged to meet at Dave's arrival gate but Dave ended up arriving in the other terminal. Remember, Dave had Art's ticket to Heraklion, if Dave had missed the flight to Heraklion, Art would have missed it too. I'm sure Art would have been able to talk his way onto the plane without his original ticket but it seems that he didn't actually know where he was going beyond that. Art was relying on Dave getting them to the hotel. As it turned out, by some weird series of events, they did end up meeting and it all worked out. The Athina Palace Hotel was beautiful. They told us that we were the first Americans to stay there all season. I may not have mentioned to you that Dave actually lived in Heraklion when he was younger. We made an unsuccessful attempt to find his family home. Santorini was wonderful. Bahram, Marcie, Jeff and I rented a car one day and saw a lot of the island. The hotel was a great location -- away from the noise of the city but within walking distance to anywhere we wanted to go. Athens is, of course, a big city. I think given the opportunity to plan this trip over, I would have gone to Athens first and ended with relaxing on Crete. I wish we had stopped in to meet you. There was just so much to see and do that we ran out of time. All in all, it was a wonderful trip. Thank you for all your hard work in making it all go as smoothly as possible. I've been trying to have the time to write to you all last week. I hope you have received our present (we asked the Cypria Hotel to give it to you), we were also looking forward to meet you in Athens but everything was so hectic!!. I promise I will write a very detailed letter on all our trip, but now I'll just say it was the very best vacation/trip/adventure we have ever had. And we owe a lot of the enjoyment to your effort: you have been a true guide to us and all your work has been highly professional but what was more important so very kind and warm. THANK YOU!! Jennifer and I wish to thank you very much for helping us organize our honeymoon in Greece. The trip was fantastic! Everything went very smoothly and our accommodations were excellent. The Plaka Hotel in Athens was in a great location and very clean. The Royal Myconian was luxurious and Elias beach was beautiful. We especially liked staying at Lefkes Village in Paros. Lefkes Village is beautiful and set in the pretty mountain town of Lefkes. The hotel staff were very friendly. We would definitely recommend this hotel for other honeymooners. We very much enjoyed having a car on Paros, so we also rented a car on Naxos to explore the island. Dana Villas in Santorini was wonderful and the location near Fira was excellent for walking into town. The staff at Dana Villas were very knowledgeable and friendly. On Santorini we went sailing to Nea Kamani and hiking up the volcano and sailed into the sunset near Oia...beautiful. All the transfers were smooth, except for when we arrived on Santorini. Bellonias Travel did not pick us up and we had to take the public bus. We called them and they apologized and offered us a free transfer to the airport when we left Santorini. We had a terrific time and will definitely recommend you to any other friends or family travelling to Greece for honeymoon or vacation. Just a note to let you know that we were very happy with our hotel accommodations and how everything was organized. We had great rooms in terms of view and location within the hotels. Our trip was fantastic! I just wanted to drop a line and thank you again for expediting so wonderfully my holiday arrangements as well as to let you know that we loved Santorini very much and that Christos and his mom (Neoklassico Koukouli) have a very beautiful and romantic place and we thoroughly enjoyed staying there. If you do speak with Christos again anytime soon can you please let him know how pleased we were as we never got a chance to say goodbye to him. Thank you for your assistance in arranging the travel for my son and I. We have just returned home from our vacation to your country and had a fabulous time. Greece is a perfect vacation site for all who enjoy good food, beautiful scenery, friendly people and and incredible history. The Platka area and especially the Adrain Hotel was our favorite time spent in Greece with Mykonos/Delos , Hania, Santorini, and Heraklion following in order. Your selection of hotels for our stay was excellent. Thanks for your efforts in arranging our holiday accomodation this year in Paros. We had a wonderful time, the Hotel was great. let me tell you that the trip was really wonderful and that we did in fact more than what I had planned. The Plaka hotel was in the right place of Athens (for us). The view of the Acropolis was so splendid at every time of the day that the next time, when they give me a city view, I will surely cry a lot. All your contact companies worked well, as their transfers. In Bellonias Tours, they have a girl (Efi) whose mother is from Peru and speaks nice Spanish; she was very helpful. Nice Porto Fira Hotel, except that I still wander what is a privilege room. Maybe because we had a small fridge? No TV set. We didn't get any help with our luggage and had to go doooooown all the way to the entrance. Now I understand why the Atlantis Hotel is expensive. But terrific view! About Mykonos, I think it's nice for pictures, but except for the fascinating visit to Delos I wouldn't return there. Good Hotel the Aegean. About the St. Nikolis, a little story. We got there at 10 pm, with a delayed flight from Santorini. No one at the lobby, and a room with the lights on across the garden. I waited 5 minutes and nobody came. I had to go to that room to ask one of the two men seated about the people in charge. One of them stood up, and with no word got to the lobby, took one key and said: follow me. While we went upstairs, this close relative with the man of Neanderthal tried to convince us that the size of our room would be small for a third bed and that he could offer us a bigger one, but that would cost more. I refused. The room wasn't prepared with the third bed. And he said: I will prepared, BUT LATER. He opened the window , took the air condition control and left the room. 45 minutes later, we still had no extra bed. We left for dinner, and later on we got it finally but he had disappeared again, and we had a really hot night. The next morning we had to ask for the control. I think we were punished by him for not accepting the other room. The rest of the days were fine there, no problem, Nice place Rhodes, It's a dream to walk along the medieval streets. So, Uli, thanks to your efforts we had a really beautiful trip to Greece. I hope you liked the alabaster scarab we bought in Egypt for you and if we may go to Crete the time we visit Italy ( in two years I hope), we'll be again in touch with you. everything worked out fine. The tours were great. A job well done. dropped us off at midnight in Raffina and we took a cab straight away to Hera Hotel in Athens and arrived about 1:00AM. The next day we enjoyed our all day tour to Delphi. It was beautiful. Once again, it was great doing business with both of you and I look forward to working with you again. Thank you once again for a GREAT JOB done and I look forward to hearing from Kiki regarding pilgrimages. I just wanted to thank you for managing all the details of our trip. We had a WONDERFUL time. All of the properties you selected for us were absolutely perfect. The Astra Apartments in Santorini afforded us the most exquisite view, and the pool at the Astir in Paros was like an Oasis. Both our vacations are over and Unfortunately I am home. the weather here has been rainy and muggy, my tan is beginning to fade, and the watermelon and fish just don't taste the same. I had a wonderful time. I hope your vacation was as enjoyable. Everything went without a hitch. The meet and assist on Mykonos met us, but then promptly disappeared. I saw him riding off on his scooter. Luckily the hotel Leto is within walking distance from the boat, so, after asking around, we were able to find the hotel. All of the tours were exceptional. You may want to tell those who want to go on Chat tours to Mycenae that they must buy the lunch if they want to eat. Chat Tours owns the Amalia hotels where the lunch is served. The hotel is outside the town, so there is no place to go like a taverna, and I was starving by the time for lunch, so I bought my lunch at the hotel anyway. I had a wonderful meeting with my family. Thank you for finding me the phone number. As it turned out, my cousin, John was on holiday on Mykonos at the same time I was there, but I could not find him. The hotels were perfect and easy to get to where the sites and the Retsina were to be found. I think you should tell anyone who wants to go to Thira that They should plan on renting a car. It is very easy to do and not all that expensive. If they want to go to the ruins or to find a taverna outside the city of Thira or just get a good look around, a car is essential. Tell them not to miss the museum at Thira. It has all of the artifacts and murals found at Akrotiri and is breathtaking. Speaking of renting...I rented a scooter on Mykonos and almost killed myself. I missed a bus by inches. Iota, the bartender at the leta hotel even gave me free wine to clam my nerves when I "walked" back to the hotel. Now for new business. I am coming back to greece for three weeks, next July. I will be bringing my wife and daughter. So it looks like you will have to put up with me again. I will send you the itinerary I want to follow in a week or so. I have as much fun planning the trip as going on it. (well, almost.) I know one thing, We will stay at the Royal Olympic in Athens and the same hotels on Mykonos and Santorini. The only thing you must do is think of another Island for us that is out of the way. I want my girls to experience the islands where the greeks outnumber the tourist on at least one island...one that is not so crazy. Until then Aliki, I leave you with my best wishes and many thanks for making my trip as perfect as I hoped it would be.....YAMAS! Ps. Say hello to our driver George...He was super. Nous avons passé de très bonnes vacances. Tout s'est très bien passé. Un tout tout grand merci pour votre aide. We wanted to let you know what a wonderful time we had on our trip. Everything worked our just great! All the places we stayed were very nice and friendly. The cruise was a lot of fun and the excursions were good. The islands we visited were all beautiful. I have never seen such extremely blue water in all my life. It was all so beautiful, especially Santorini!! It was picture perfect, and Bob and Beth took lots of them!!! Our road trip was a lot of fun and I am very glad Bob decided to do that. I was a little apprehensive, but it was fun. The mountains were great and the small villages were so quaint and friendly. Thanks for suggesting the places we stayed and the places to visit. We really appreciate all the time and energy you spent on helping to make our trip such a memorable one. Your country is truly beautiful and so are the people we met. I wish we could have met you and thanked you in person, but I hope this will be sufficient. THANKS, THANKS, AND THANKS!!! We will be sure to mention you to all our friends that might be considering a trip to Greece. We just wanted to thank you for all of the arrangements that you made for our trip to Greece. We had an absolutely delightful time and look forward to a return visit. You are welcome to use our names as references if any of your potential clients should want to contact us. Thank you very much for your cooperation, I really appreciate it. Because all of you there at Dolphin Hellas have been so helpful and nice, we will DEFINITELY use you guys when we do decide to go to Greece. Once the baby is born and we are settled in, I will again contact you to make further arrangements. I'm sorry for the confusion and the lack on my part to get in touch with you sooner, I should have. Thank you for all your help and I wish you all the best. I just wanted to thank you so much for all of your help with our Greek Odyssey. We had a great time, and the accomodations were wonderful. Everything was great and we had a wonderful time. Now we await the pictures. Thanks again for all you did. Hello from Colorado!! Kostas, I just wanted to write and thank you for all that you did to help make my stay and Kati's stay in Greece so pleasurable. The Greek people are still the kindest most gracious people I've met. Our stay in Mykonos was beautiful. The trip to Delphi was wonderful--Kati really enjoyed seeing the ancient ruins there. And all along the way throughout our entire trip we met the most amazing people. We went to Paris--one of the most beautiful cities I've ever seen. Ireland was so green and cool--sweater weather which I welcomed after the heat of Greece. It's good to be home. Kati developed pneumonia and so was very anxious to get her home as soon as possible. She's doing great. Our trip was truly remarkable and unforgettable. I'm very glad to have had the opportunity to meet you and Esther. Seeing her sweet face at the airport when we arrived meant so much. Please tell her hello for us. I hope one day to see you again. If you ever find your way to Colorado please know that there is always a place here for you to stay. Again, thank you always for your kindness. As you said, no news is always good news, the only thing we regret about our visit to your fabulous country is not having time to meet you and thank you in person for a wonderful vacation. I think the cruise was a wise choice because we wouldn't be able to know so many places in so little time, or maybe we would, but it was a stress-free way of doing it. Our favorite arqueological site was Ephesus it is really something else, and meeting the Turks made us understand the true meaning of "good merchants". Mykonos and Santorini deserve all the fame indeed and the Corint channel was an amazing experience. The food on board was delicious and for not being a luxurious ship, I think it serves its purpose very well and the crue does a really nice job. It was for all a memorable experience, thank you once again for making that possible. On the other hand, we enjoyed it so much that we want my mother, (she stayed home with the kids) to do it in the future, maybe even by the end of the year, can you tell me which is the low season in order to get the very best price possible and if we can buy the airline tickets directly from you, she would depart from Mexico city, maybe with a friend. The cruise director told us about a cruise to the Nile, maybe we can start planning for summer 2001. Dear Uli, Thanks for all your work to help arrange our trip. We had a great stay in Greece! We met fine people, enjoyed beautiful scenery and buildings, learned to travel on the ferry system, and learned to speak some Greek. Our 30th wedding anniversary trip was one to remember. We just returned home after a wonderful vacation in Greece. All the reservation that you arranged for us were excellent. I wish to thank you and Dolphin Hellas for a very professional service. I will certainly make use of your services if I ever visit Greece again and will be happy to recommend you and Dolphin Hellas to anyone who plans to visit Greece. Thanks again, and best regards. You've probably forgotten who I am by now, but I have just arrived home from Europe and go back to work next week, and I wanted to thank you for all your efforts on my behalf when I was in Greece. Everything went very smoothly - despite the ferry timetables. All the hotels were really nice, the people very friendly, the transfers efficient - even at 4 o'clock in the morning - and I had a wonderful time. So many thanks, and I will certainly recommend you to anyone else going to Greece. We all wanted to thank you again for all of your assistance with our travel arrangements to Greece. We had a wonderful time and enjoyed the people of Greece so much. Our hotels were all very nice and located well for our needs. The Butterfly Villas in Santorini were especially beautiful and relaxing. Please know that Efi at the local agency in Santorini is outstanding. She checked at our hotel at 4:00 in the morning to be sure we had gotten in and picked up at the ferry, which was very late, and everything was going smoothly. She gave us a 24 hour phone number and arranged a great tour for us. Thank you again for your outstanding service to us. We hope to return to Greece and will definitely call upon you again. I just wanted to thank you for all your help in making our recent trip to Greece such a pleasure. The tickets for the cruise were waiting for us at the hotel--the Aegean I was a very pleasant ship and the itinerary was spectacular. We were saddened at the problems Aegean Spirit seemed to be having as we left Crete and hope everything was OK.
You can be sure that I will call upon you again when I return to Greece and will recommend your agency wholeheartedly. Returned from holiday in Naxos on Tuesday night. Just to let you know we thought the Hotel Fikas was excellent and the family who run the hotel were very friendly and helpful. I would recommend the hotel to anyone wanting a nice place to stay on the edge of Naxos Town and for anyone with walking difficulties the cab fare is only 1500 drx (about £2.80). We certainly wouldn't have any hesitation in staying there again. We just arrived Singapore safely this morning. The trip was an enjoyable one, except the 50 hours of suffering due to the ferry from Santorini. Thank you so much for arranging the hotels and ferries. I'm most impressed by your efficiency and will recommend your company to my friends. Just thought I would drop you a line to thank you for all the work you did ensuring that our honeymoon in Greece was incredible. Although the taxi drivers in Athens did their best to rob us of all our money, the Herodian Hotel was a beautiful location to sleep off jet lag and close to everything in Athens. Kanale's in Paros was beautifully located and the staff were incredibly helpful and friendly. The Alkioni Beach Hotel was also beautiful and the breakfasts were great. In Santorini, the Regina Mare Hotel had an incredible view and the staff were nice, although we didn't have a working toilet for the whole week. Anyway, thanks again for making these recommendations and we will be sure to tell our friends to contact you if they are heading to Greece. Thank you for your assistance during our travel to Greece. We had a wonderful time! I met a man on Mykonos so I may be coming back again in August :-). We highly recommend the Aegean Hotel in Mykonos. The staff was very accommodating and went out of their way to make us happy. The rooms were large, clean and the pool is lovely. Just wanted to let you know. Well, we are back home. We meant to go the the agency to personally thank you, but there was no time. The flight on Aegean was superb. Great seats and very good service. The hotels were the best. We especially loved the Grand in Rhodes. We'll be back!! Soon we hope. And we are keeping your email handy.. Thanks again, You have a fabulous country. George's greek was great too!! My family and I arrived home safely from Greece after a wonderful vacation. I wanted to take the time to thank you for your assistance booking hotels, and to give you a little feedback on our experiences. Enjoyed the Electra Palace and the location was super. Rooftop pool and breakfasts were great, service just ok. Cypria was great value at only $88 per night! Nice accommodations and breakfast was good. We were a bit less comfortable walking to our hotel late at night, however, as that whole area shuts down when the businesses close. The Neoclassico Koukouli in Santorini was a charming place in a location where we could get a good night's sleep. Unfortunately, it was very difficult to find so we lost some time on arrival. The owner was charming, though communication was difficult as she spoke little English. The service at the Petassos Beach in Mykonos was the best I have ever had in any hotel I've ever stayed at - anywhere in the world! Funny thing is, if I'd known it was a chain, I probably would have been very disappointed when you initially booked it. Since it was small, and definitely run by locals, the feel was very special. Rooms were particularly nice and breakfasts great. Our flight from Athens to Santorini was fine. Ferries were a tremendous experience. Both ferries we took were fast boats - the smaller blue hydrofoil (not the catamaran) to Mykonos, then the brand new huge superfast ferry back to Athens. That was a particularly great experience until we all nearly choked to death on cigarette smoke on the trip back. Kind of makes us grateful for the smoke free accommodations we have here in the U.S. - and which we take for granted. On our last two days in Athens my daughter and I took the trip to Delphi one day, and the trip to Aegina, Poros, and Hydra the other. Both were worthwhile, and thoroughly enjoyable experiences. All in all, a fabulous trip. We loved Greece, and everything about it. Our thanks for your assistance in planning our trip. Thanks for everything, really. It's been very fun working with you. We found you on the internet by accident and we're glad we did. I would recommend you highly to anyone who needs assistance in Greece. I feel relieved and comfortable that we have a place to land. It is now two weeks since we returned to Australia after a wonderful four weeks in Greece, and all the anxieties we had in planning, booking, and executing our adventure are behind us. We have so many happy memories of a barren, mountainous, yet charming and alluring hinterland of Greece, together with the many harbour and seaside vistas, that our ten hours of video and numerous rolls of film will always remind us of a truly great adventure. All that aside, the best part of any holiday/adventure is the people you meet and the culture you experience. Arriving in Athens at 6am to be taken to a Hotel that you know nothing about, and be met by a lady who speaks no English, yet offers coffee and juice to "bloody tourists", but becomes a good friend after three visits is what life is all about. We were naturally apprehensive when we made the treck to your office the same day, but your friendliness and warmth assured us that we were in for a good holiday. We didn’t come to Greece for the sun, but for the history/mythology, and we were not disappointed. You would be proud of your Aussie friends who tramped over many historical sites, with either a book or a guide to ensure we learnt whatever we could about Greece’s unique place in history. The trip we did could not have been achieved without your help and guidance, and we wonder if you have a place as a "wholesaler" to one of our leading Travel Agents in Australia. No holiday is complete without declaring highlights and Denise and I are naturally divided on some of these so we declare them in no particular order. Greeting by Mary at the Art Gallery on day 1. With coffee and juice, followed by a stroll to the breakfast balcony to see the Parthenon above us. Nervous walk to Dolphin-Hellas to be greeted by a charming and knowledgeable young lady (Aliki) who set the scene for our Greek Adventure. Sitting on the balcony of the Hermes Hotel at Delphi with beer and wine in hand appreciating that we are special people, as the sun blazes across the valley below.. Forget Kalambaka and go to the Sydney Hotel in Kastraki ?? or similar, to be right next to the Monasteries. Monodendri is not that far off the beaten track, and worth the trip to see the shale and the Vikos Gorge. Parga is a little out of the way but we could have spent a few days instead of a few hours there. Olympia is a lovely town but the historic site is disappointing, as are many in Greece, because they are very poorly signposted for the general public. Mycanae is a pile of rubble to the average tourist. Such an important historical site surely deserves better signposting. Back to Athens…our soul City with Con, Janet, and Mary at the Art Gallery, and Aliki and Kiki at Dolphin Hellas, not to mention our new friends at the Flea Market. Rhodes is mystifying. We spent so much time in the loft of our room at the Cava Doro drinking wine and beer trying to fathom the chequered history of the island that in the end I read from a prepared script into the video camera. Lindos was fantastic, even though touristy, but the highlights were the street of the Knights of St. John, and the little Orthodox Church near the Cava Doro. Crete is naturally beautiful, and we drove most of the island. The little villages high in the mountains were our highlight, and we have hand-painted plates to prove it. Iraklio is the ugliest City in Greece, but next to Athens, Hania is our "soul city". Elounda is a place we could spend more time at. The southern coast of Crete is best forgotten. Remember the IMBROS GORGE as a great alternative to Samaria. Mykonos .Barren windswept rock that can be deleted from travellers itineraries. Delos is fantastic, and the only reason to spend a day on Mykonos. Greece is a fantastic blend of mythology, history, culture, landscape, charm, and PEOPLE, and it is always the people that make the place. Back in Nangiloc, 500 km from Melbourne, 1000 km from Sydney, and 400 km from Adelaide we are coming into Winter with night temperatures of 0.c and daytime temperatures of 17.c. We are currently pruning our plum trees, and will soon be picking our navel oranges. We have clear skies at night with unbelievably spectacular starlit nights. We are one of the clearest areas in the world for stargazers, and being in the "bush" the serenity of our area is precious. No holiday is perfect, and I have to say that our "hire-cars" were disappointing. Emko gave us a car with no aerial, so, the radio did not work. I pointed this out on return but there was no apology. On Rhodes, the Euro-Car car radio did not even switch on! On Crete, we were meant to be happy that the car we requested was not available and we were getting an up-market Vitara, but it turned out to be a gas-guzzling rock-hard seated TANK, that was neither a joy to drive or re-fuel! Aliki, we are indebted to you and your staff for helping us to enjoy a holiday experience of a lifetime, and we hope to remain your friends. It is now May 24, and both my sister and I are back home again. You were right. The trip was fabulous, everything went smoothly, your country is gorgeous, and your people warm, kind and generous. It is a trip both me and my sister will never forget. We apologize for being such paranoid travelers, and want to take this opportunity to thank you from the bottom of our hearts for your kind efforts and professionalism. We will not hesitate to recommend you and Dolphin Hellas to anyone here in the United States. All the best to you always. Tina S. and Charlene L.
Just a quick note to thank you for all your helpful information. We are just back from 3 weeks in Greece and your website and letters were a great source of helpful ideas and contacts. In particular, we never could have done what we did (4 islands + Peloponnese, Athens and Delphi, Comfortably!) without the unbelievably thorough, flawless and kind help of Uli Perschau at Dolphin-Hellas. She and I emailed for 4 or 5 weeks and set up a most wonderful and amazing itinerary. (Based on your advice, it included about a week in Crete!) Uli is out of this world and I would recommend her more than highly. She not only set everything up without a wrinkle, she was able to make changes along the way, and both were invaluable. Thanks, really. We have wanted to see Greece for years, were there for Easter (Chania!) and could not have had the outstanding and unforgettable experiences we did without your advice, and Dolphin-Hellas/Uli in particular. Our only problem now is figuring out how quickly we can get back again! I wanted to write and thank you for helping us with a wonderful honeymoon. Jill and I enjoyed Greece very much. We got to see many contrasting locations. Crete was lovely. It was almost like Venice (without the canals, of course). We enjoyed both Hania and Rethymno very much. I wish we would have seen Knossos, as I heard it was spectacular. Also, to our disappointment, the Samaria Gorge was in fact open. However, we did not pack for such a trip and could not go. Casa Delfino was beautiful and the ladies there are so friendly. The Veneto in Rethymno was nice, though the management seemed pretty disinterested in us. Santorini was probably the most beautiful place of all. We chose this as our time to relax and spent many hours looking out of our balcony. We did hike the volcano and rode donkeys, though. I think the donkey ride was our favorite. We really enjoyed the staff at Tzekos Villas. Kostas the evening receptionist was really friendly and we spent many evening chatting about everything. Efi from Bellonias tours was very friendly as well. Athens was fabulous. Seeing the Acropolis was just amazing. It's almost surreal. You see it in textbooks all your life, but nothing compares to being there. The Delphi trip was probably our best day of all. It was a beautiful drive and an amazing sight. We loved the Electra Palace. The staff is very professional and the views from the roof are great. Plus the breakfast is awesome. I could not get enough of the juice machine. I'd never seen anything like that before. We thoroughly enjoyed ourselves. If we had it to do over again, we would probably do a couple of things different. We would probably have cut Santorini down to 3 days and spent more time in Athens for day trips on the mainland. I would have liked to visit Olympus and a couple on our return flight mentioned some place that Alexander the Great had built. I forget the name, but he said it was amazing. We would have also brought better shoes for the Samaria Gorge and visited Knossos. So, the plus side is that this leaves us open for a return trip to visit all these sights on the mainland. My wife wants to visit Italy, and I want to visit Spain, but a return trip to Athens could be in the plans in the next few years. I will certainly hang on to your email address until then. We just wanted to tell you that we had a wonderful trip to Athens and Lesvos. Thank you very much for all your help. All the reservations worked out perfectly. The weather could have been a little warmer, but I guess that is a little bit out of your control! Thanks again. When we plan our next trip to Greece we'll let you know. Just wanted to let you know that we had a wonderful time in Krete and in Athens. Everything you organized worked like a charm. We really appreciate all you have done for us and we will definitely recommend you to anyone who wants a travel agent for Greece. There is no better one!!!! Dear Uli: I just wanted to e-mail you to thank you for your help in planning and putting together our trip. I, my wife and my daughter had a wonderfull trip and time in your country. All the arrangements you had made went smoothly and we had no mistakes or problems. I was especially pleased with service provided by the car rental company and would reccomend them to anyone. All the hotels were fine. The only complaint we had was that many of the sites closed early this time of year and you couldn't get into many of them in the afternoon. You may want to tell anyone going offseason to go to the sites early and first thing in the morning. If you have any questions about specifics I will be happy to answer them. Otherwise thank you again for helping make it a great trip and an experience my daughter will not forget. Epharisto. Egidijus M. and family. Want to take the time to wish you a Happy and Holy Easter. It was really good to see you again and you know once I was back home, it only took a few days to wish I was back in Greece. Crete especially with its beauty and tranquillity. When anyone asks what part of the trip I liked best - Immediately think of the Koutsonari cottage. Its an automatic response. Not so much Ieropetra but the cottage itself. You planned a wonderful itinerary for me. Chania - old town was an experience and I thoroughly enjoyed the old town and its way of life. I found it very frustrating trying to get into the old town but once there, I loved it. I will send you a map from the center of town to the old town when I have a chance to make it. Maybe you can keep it with the pictures of Porto Del Colombo when I get them all printed of the 48 rolls of pictures I took in Crete, I've printed about 25 of them. They are beautiful and I will pick out some of the better ones to send you. I'm so glad you added rethymnon to my schedule. It is very nice there and surrounding area well worth exploring. The hotel was in a perfect spot, on the water, with great access walking into town, and the surrounding antiquities. About Iraklion , I will write about it in my next letter. I will be getting a computer in the next few weeks. I think its already in the planning stages. Then we'll be able to keep in touch . for how I have to Thank Rick my friend for emailing you. I ordered the book Corelli's Mandolin before I lift for Crete, It was sold out so I had to order it when I returned home. So far I've read up to Chapter 2 and have enjoyed it What I need is time.... Time , whats that? Again Thank you and Happy Easter!!! We will certainly recommend your agency to any of our friends! Thanks again and hope you enjoyed your elk. Sorry it couldn't be the real thing. Just wanted to drop you a note to again thank you for the great job you did in setting up our trip to Greece! Everything went very well (other than the incredible wind that about blew Monica and I off Santorini!). Had a great time, and everything you did was perfect. Please feel free to give our e-mail out as a reference if you need to. Sorry we didn't get to take you to dinner. We had great food and saw great sites. Was delighted to get back home, though. There's no place like home, wherever you're from. You were wonderful!! Because of you, we had a marvelous, fantastic trip to Greece! Everything worked like clockwork and there were no problems. The hotels in Naxos, Santorini, and Rhodes were so charming and lovely. 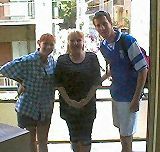 Aliki (you were gone that day) gave me a travel agent in Chios and I called him and he got the Diana Hotel for us. On the way over, we were able to upgrade and got a cabin and slept. But on the way back from Chios to Athens, the ferry was so packed with all the voters that we had to sit. I met two sets of cousins on my mother's side and that was so wonderful (and emotional) for me. suggestions and travel arrangements you made for us! Mary and Dan C.
Thank you very much for organising our holiday. I called to meet you on saturday but the door was locked. We had a wonderful time on Sunday with the carnival in Plaka. Everyone was so friendly and so helpful with my very poor Greek. The hotel Hera was excellent and very friendly. We will certainly return again soon to visit your exciting city. In November, 1998, you helped arrange the Royal Olympic cruise details and hotel-Piraeus transportation for my wife's parents (Ken & Carma B.) and their six children and spouses as part of celebrating their 50th anniversary. A while thereafter, you sent me an email, asking if I could send a group photo of our trip. Although I didn't forget, I'm deeply embarrassed to say that it has been on my to-do list since then. I've finally got a photo of us at the Acropolis that I'd be happy to send. However, I have just one small question concerning your mailing address, as it appears on the calendar card that you sent me. Which street should I use, 16 Athanassiou Diakou Str., 16 Syngrou Avenue or 19-21 Makriyanni Str.? If you can clarify that for me, I'll get the long overdue photo on its way ASAP. By the way, you may be interested to know that even over a year after the trip, when we get together, it seems to surface in conversation, always with the sense of excitement and gratitude. Thanks again for what you did to help make it possible.